Synology DiskStation series NAS is good for backup. Then, how to backup Windows 10 PC to a Synology NAS? 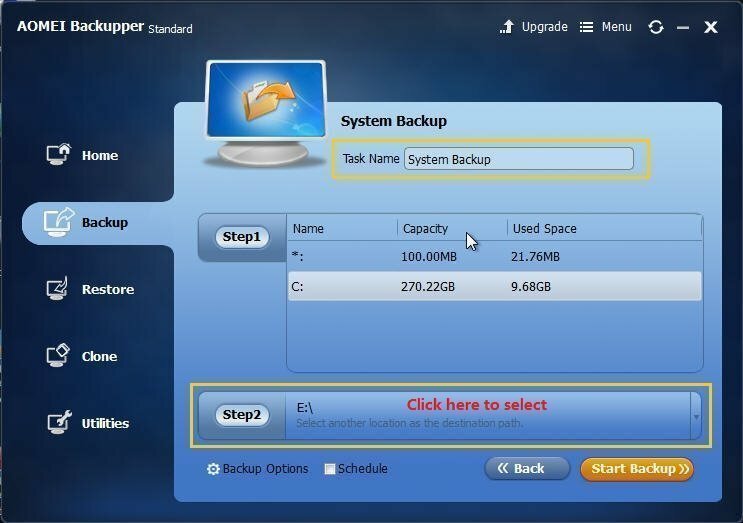 Try the best free NAS backup software - AOMEI Backupper. Why Backup Windows 10 to Synology NAS? I bought my computer 5 years ago, I have encountered a very serious problem that I can't boot up my computer, and I don’t know how it happened. Since I’m not a technician so I turn to my friend for help, he told me that my Windows 10 is corrupted and I have to reinstall Windows in my computer, and then he helped me to reinstall Windows 10 system. I’m so excited my computer works eventually. However, many applications I installed before is gone, which makes me spend a lot of time to reinstall. After this, I find the best solution to restore system is to backup data from Windows computer to Synology NAS. With the data increasing, the free space of my hard disk is also reduced, and I have to backup Windows 10 Operating System to Synology NAS. I can restore my Windows 10 to the previous state if my computer cannot boot up again or damaged by improper operations or other errors. It’s obvious that backup OS to Synology NAS is the ideal way to repair Windows problem. How to backup Windows 10 PC to Synology NAS? There are two ways to realize. First, the backup program comes with Windows 10. Second, use the third party software - AOMEI Backupper. AOMEI backupper Standard is more efficient than Windows built-in Backup program, and it’s the easiest way to backup data to Synology NAS. 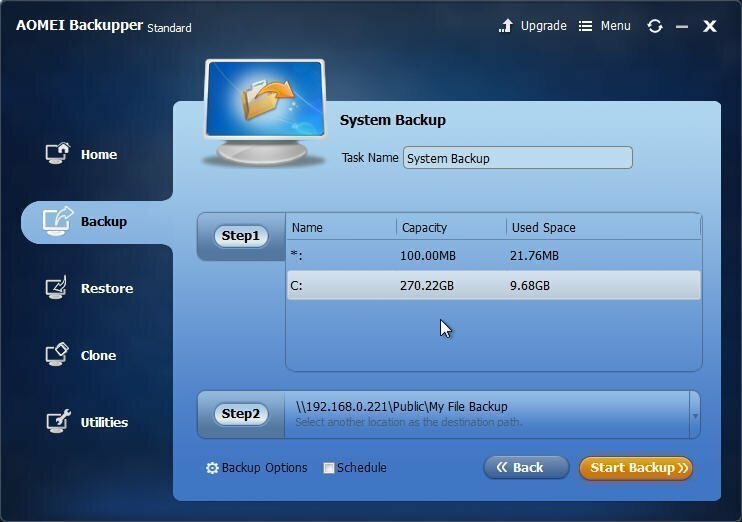 Furthermore, AOMEI Backupper Standard is a freeware which supports many backup operations, clone and restore features. In this post, you’ll see the guidance about how to backup Windows 10 computer to Synology NAS with AOMEI Backupper. Make sure your Synology NAS software and hardware installed. Confirm Synology NAS can work. Please ensure your computer and Synology NAS within the same Intranet. I’ll take system backup for example in below text. 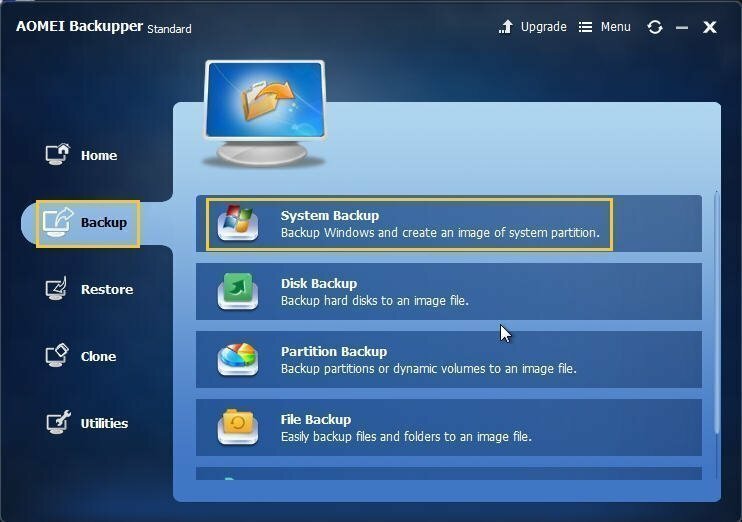 1.Launch AOMEI Backupper program, on the main console, choose "Backup" -> "System Backup". 2.In next window, enter a name in "Task Name" box (here is System Backup). Click the button in the "Step2" to select Synology NAS to save the image file. Tips:The AOMEI Backupper program will select the partition associated with system files automatically, including system partition and system reserved partition, so there is no need to select manually in the "Step1". 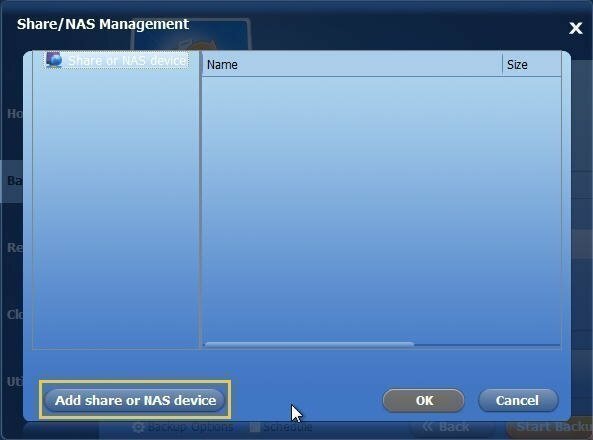 3.Then select "Share/NAS" -> "Add share or NAS device". 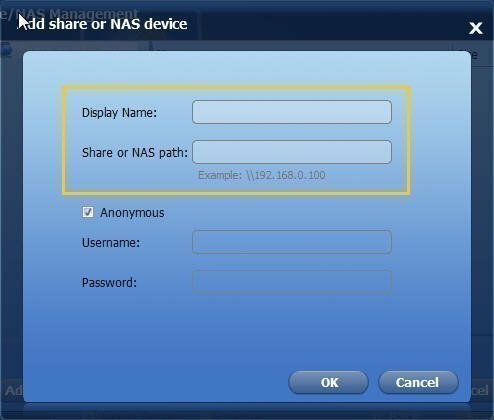 Type a name in "Display Name" and the path of NAS to enter another window, and select a folder to set up the Synology NAS as destination location. Then click "Ok". 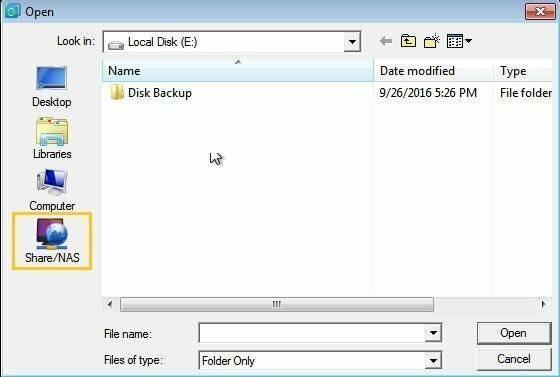 4.Press the "Start Backup" button to backup Windows 10. Wait for a moment, the operations of Windows 10 backup to Synology NAS will be completed. If you want to customise more detailed operation on the image file, you can check the "Backup Options". You can backup Windows 10 automatically by checking the "Schedule" option; you can backup via Daily/Weekly/Monthly, or backup disk by Event Trigger. After this guidance, Windows 10 backup to Synology NAS has been successful. AOMEI Backupper also provides Full Backup, Incremental Backup, Differential backup etc. And you can get more guidance about how to backup disk with the Disk Backup feature.